Fuzzy search, related articles AJAX widget. This one was requested a few times. We’ve thrown together a simple AJAX widget for showing related articles on other sites. We’ll add a little more bling later on, especially once we get some more data sets out there. The idea is this: You have a site that has information about music, or movies or airplanes or whatever, and you’d like to add links to related encyclopedia to your page with just a couple lines of customization. To make that work as one would expect we also added fuzzy search. That’s important because, for instance, the article for “Madonna” in Wikipedia is titled, “Madonna (entertainer)”. So, now with our fuzzy searching you can search for the closest hit to a term with a specific tag, in this case “Madonna” tagged as “musician”. The list of available tags is here. The new AJAX widget is trivial to use. Here’s what it looks like. If you click it’ll take you to a page that you can use to copy-paste from. topic: A specific (exact) wikipedia article name. fuzzy: Find the nearest article name. fuzzytag: modifies the fuzzy search so that it looks for an item with that tag. Note: this does not affect the related articles, for that use the following attribute. tags: The tags for the returned articles. i.e. 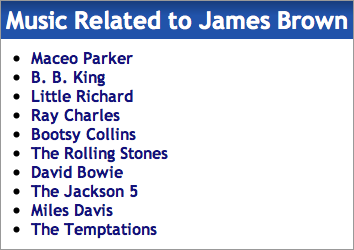 Using a fuzzytag for James Brown will specify that the main article should be a musician named James Brown, but specifying musician for tags will ensure that all of the returned results are also musicians. title: The title to be used for the list. This defaults to Related Encyclopedia Articles. prefix: The prefix to be used for the links. This defaults to http://pedia.directededge.com/article/ Here you could also specify http://en.wikipedia.org/wiki/ to link to the English wikipedia. If you decide to link to Wikipedia or somewhere else using the last tag, we’d request that you at least give us a mention in your company / project’s blog somewhere. Enjoy and feel free to drop us questions or comments!